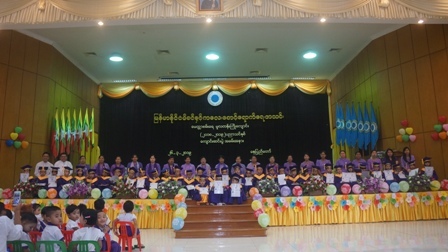 Myitta San Yay Preschool Children’s Graduation ceremony was held at Myanmar Maternal and Child Welfare Association headquarter on 26th March, 2019. The ceremony was attended by MMCWA’s President Prof. Dr. San San Myint Aung, Vice President (1) Prof. Dr. Mar Lar Win, Secretary Dr. Nwe Ni Ohn, Auditor Dr. Khin Win Thet and Central Executive Committee member Daw Than Than Sein, President and members of Nay Pyi Taw MCWA Supervisory Committee, preschool children and their parents. The ceremony was opened by playing the national anthems of Myanmar. After that, MMCWA’s President Prof. Dr. San San Myint Aung delivered an opening speech. And then, the president and central executive committee members give graduation certificates to the preschool children. Afterwards, MMCWA President and Central Executive Committee members, preschool children and invited guests posed for documentary photo. As the second part agenda, the preschool children performed dances and then, the president and central executive committee members gave gifts to (70) preschool children.